It was Blue by several points in both World and Open class competitions Saturday, July 31, as Blue Devils B continue their winning ways in the first – and last – head-to-head prior to the Open Class World Championships next week. After a five-year absence, Northern Illinois University's Huskie Stadium in DeKalb was once again the setting for an 11 corps showdown with the Festival of Champions contest. Blue Devils B (1st, 89.30) swept all captions across the board surpassing its nearest competitor, Revolution, by a staggering 5.8 points. Using music from their own staff members John Meehan and John Mapes, with Bhatia's "Interstellar Suite" as the skeleton, Blue Devils B's "Space" show explores the concepts of outer expanse and musical dimensions. It's highlighted by a sweeping side-to-side cacophony of dissonant chords that resolve into a major key, otherwise known as "space chords." While BDB comes with a complete package of talent, design, and execution that could stand toe-to-toe with many World Class corps, director Rick Odello is quick to point out that there's always room for improvement and one can never count on the outcome. Revolution (2nd, 83.50) featured talented brass and percussion lines who took second in their sub-captions. "Fade to Black" is an aggressive show, exploring the concept of light to dark – from good to evil. Welcomed back is their three-(wo)manned cymbal line reappearing after a nine-year absence. For an encore, Revolution pulled out widely differing tunes "Star Trek" and Lynard Skynard's "Freebird." "Celebration" is the word this year for Raiders from Wayne, N.J. Their buses sport it, their show, "Platinum Celebration" features it and even their music holds a celebratory feel. It's their 20th anniversary and Raiders (3rd, 81.15) are taking full advantage of sharing the joy. Opening with "Celebration Fanfare," the music runs the gambit of "Exultate" and "Exhilaration" before closing with a look to the future in "New Beginnings." The corps took home bronze in DeKalb while the color guard enjoyed a second place finish in its caption. It was Legends (77.85) and Colt Cadets (77.30) neck and neck for 4th and 5th respectively. While Legends, of Kalamazoo, Mich., held their own in brass, percussion, and color guard, Colt Cadets controlled the General Effect caption on the score sheets. Legends' show "Ruins" explores ancient Rome both visually with columns and audibly with works from "Ben Hur" and Respighi's "Roman Festivals" suite. When asked how he got the Colt Cadets to perform so well, drum major Jonathon Jackson laughed, "I told them to turn NIU to CCU." While CC members are mostly high school students, director Vicki Schaffer is proud to point out that Colt Cadets sent 14 members to World Class corps this year. In a post-show gathering, first-year percussion caption head/arranger Brian Zegus said the entire staff was pleased with the corps' performance Saturday night. "The corps is finally understanding and executing the concepts that we're instilling in them," he said. Colt Cadets' show "Sorcerer's Revenge" includes selections from "Night on Bald Mountain," "The Sorcerer's Apprentice," and "For Good" which is from the musical "Wicked." Fully integrated into the storyline, the "sorceress" character is portrayed in black garb and easily followed throughout the show. Starting out the evening was the newly formed Forte (6th, 76.65) from Grand Prairie, Texas whose show "Stargazing" contained both whimsical and powerful astronomical motifs, from "When You Wish Upon a Star" to selections from "The Planets" and "Dancer in the Dark." 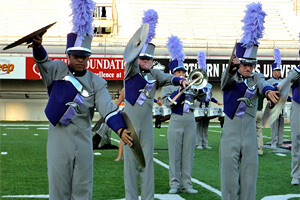 Dressed in purple – with an emblazoned "F" on their chests – Forte placed sixth tonight, but earned third in General Effect and were up two points overall. Forte's new neighbor to the south, Genesis (7th, 74.20) from the Rio Grande Valley was also the buzz last night, commanding both score and audience approval for their jazzy "One Night in the Valley" that included fan favorites "La Suerte de los Tontos," "Autumn Leaves" and "Malaguena." With symphonic music dominating corps repertoires this year, Genesis' delve into jazz was a refreshing addition. 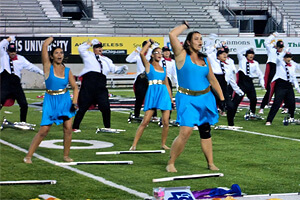 Appearing in only their third show in less than a week, the color guard has shown remarkable improvement, up 3.4 in its sub-caption. Velvet Knights (8th, 72.55) may not have won the show, but they certainly captured the audience's hearts with their "Magical Mystery Tour: The 2010 Edition." Traveling from Caribbean ("Romancing the Stone") to India ("Jai Ho") and France ("La Vie En Rose"), the show ended with "Overture to Orpheus in the Underworld", a shout "here we go!" and the guard linking arms to dance the Can-Can. The always-humorous corps also picked up an award for Outstanding Drum Corps as participants in the Lincoln Highway Parade in downtown DeKalb the night before. Coming off a whirlwind tour of Washington, D.C. where they performed in the Boy Scouts' 100th Jubilee Jamboree, the Racine Scouts (9th, 69.25) continue to refine their George Gershwin inspired show. The color guard, now decked in sunny yellow dresses, has all six ladies now integrated into the production. For international flavor, Les Stentors (10th, 67.80) filled the bill with "une, deux, trois" count offs, a French repertoire, and an interactive rock-style production that had the corps shouting "yo yo yo ya" and the crowd responding in kind. A much larger corps this year, the 2010 Les Stentors have undergone a musical style change very much accepted by the fans. The second Canadian corps, Blue Saints (11th, 55.85), returned to their familiar roots with selections from Danny Elfman's compositions including "Nightmare Before Christmas," "Beetlejuice," "Edward Scissorhands," and "Sleepy Hollow." Though the nine horns and nine battery percussion members struggled with tempos, they are quickly improving as evident of their four-point rise from the last show. The Festival of Champions was truly a festival in the literal sense. The brainchild of Cavaliers alum Michael Embrey, the competition was the conclusion of a week-long series of events in DeKalb which featured a parade, a USO tribute with the U.S. Navy Band, and a food festival. Pre-show entertainment included Highland dancers, bagpipes, and the Marlyn's Majors – a baton twirling unit accompanied by drums. During intermission there was a salute to our U.S. veterans, acknowledging those in the stands who served our country. 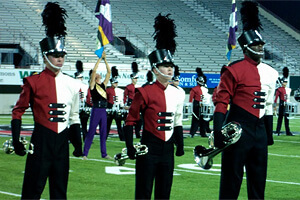 Though a few Open Class corps have already ended their 2010 seasons, and some are just now headed toward Indianapolis, the Festival of Champions provided a taste of the excitement to come with the DCI World Championships kicking off in Michigan City, Ind., Tuesday, Aug. 10. View a complete recap of scores from the Festival of Champions.